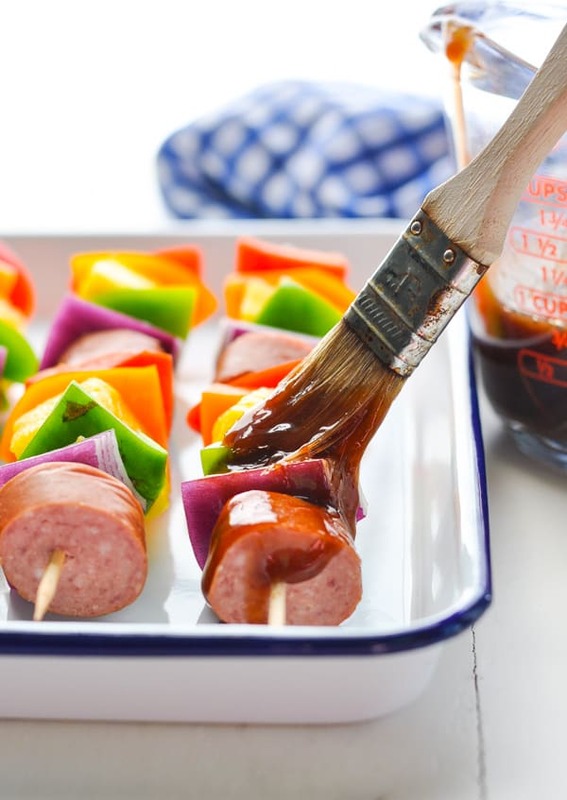 Savor every moment of your summer with an easy dinner recipe that's perfect for the season! 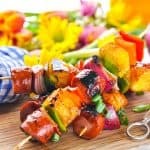 From get-togethers with friends to pool parties, camping trips, and family cookouts, these Hawaiian Kielbasa Kabobs are a fresh and simple option that suits any occasion! 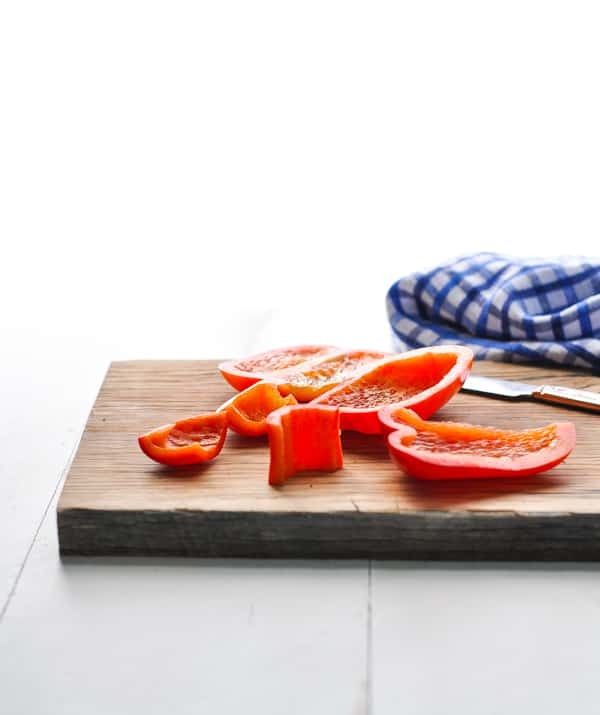 Savor every moment of your summer with an easy dinner recipe that’s perfect for the season! 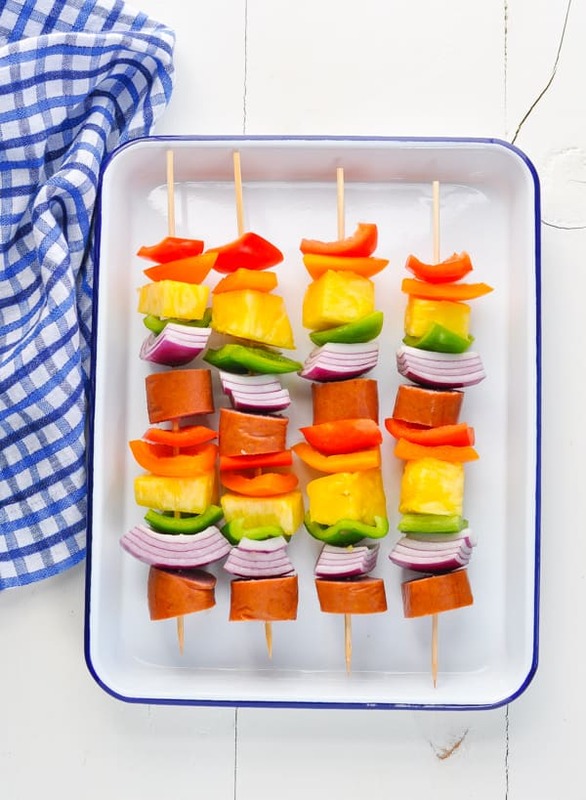 From get-togethers with friends to pool parties, camping trips, and family cookouts, these Hawaiian Kielbasa Kabobs are a fresh and simple option that suits any occasion! 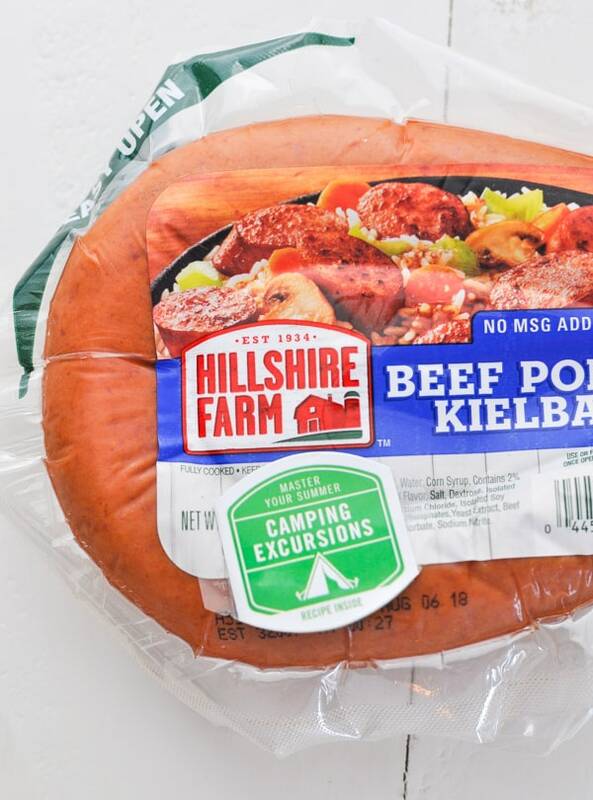 Fortunately, Hillshire Farm® Rope Smoked Sausage makes meal prep quick and easy, thanks to fully-cooked kielbasa that’s ready for a good char on the grill or over the campfire! Do you have a camping trip on your agenda in the coming months? Our boys are still pretty young, so the extent of our camping thus far has been exclusively reserved for our backyard! However, that doesn’t mean that we can’t enjoy delicious campfire foods! Keith built a fire pit a couple of years ago for exactly that purpose — s’mores all season long! But we’ve gone beyond roasted marshmallows this year, and we’ve ventured into backyard fire-roasted chicken, pork chops, and now kielbasa kabobs! Yes! 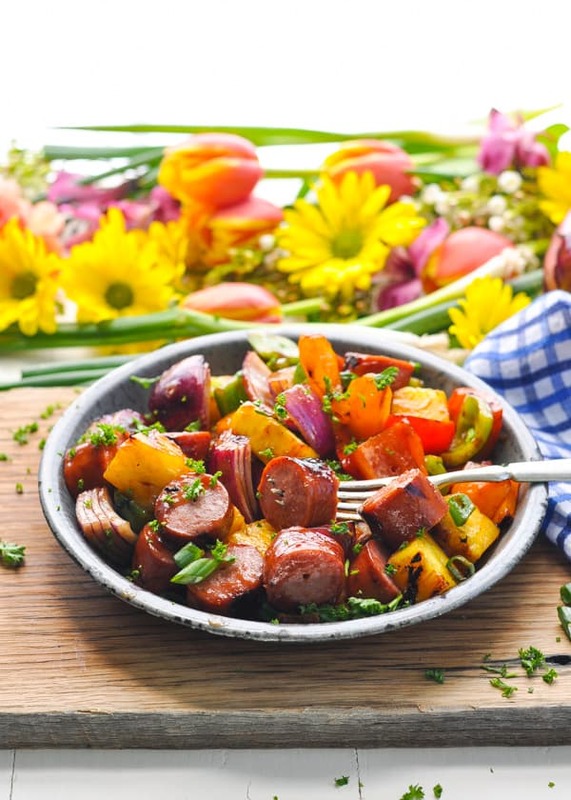 These kabobs are especially convenient for the campfire or grill because they take advantage of Hillshire Farm smoked sausage, which is slow-cooked with natural spices using quality cuts of beef. That means that we just have to “finish” them over the fire to give the meat that great crispy exterior! 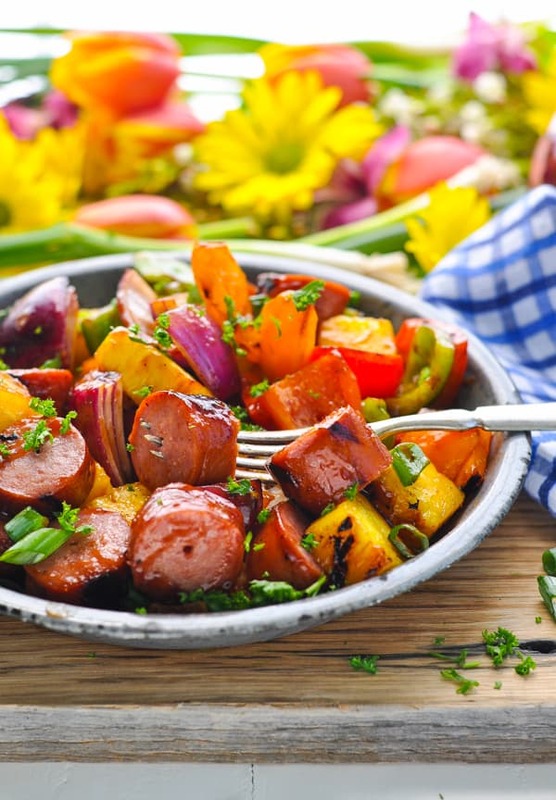 The kielbasa is a quick-cooking option that’s easy to pack in the cooler and transport to your destination. 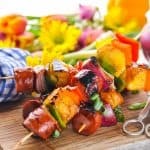 But don’t worry — even if you don’t have a camping excursion on the agenda or a fire pit in your backyard, you can still enjoy these easy kabobs! 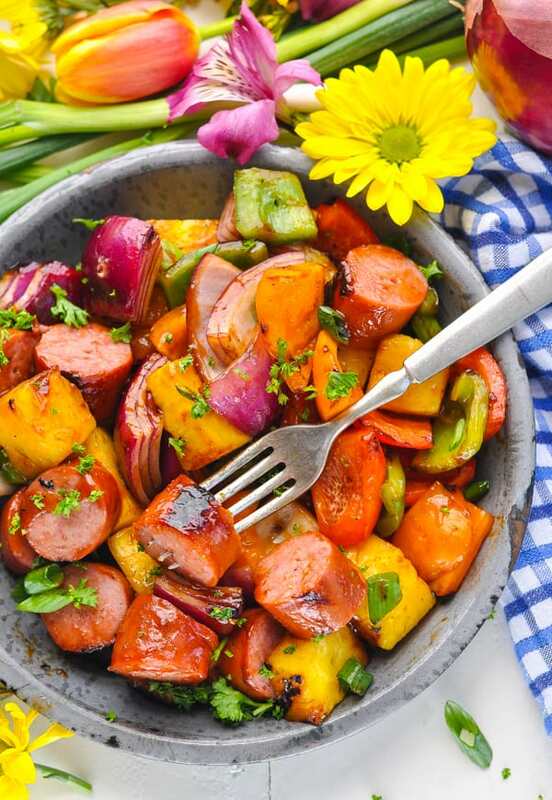 Just get a grill pan, a griddle, or a large skillet really hot on your stovetop and you’ll have charred kielbasa kabobs in no time! You’re obviously going to start with the kielbasa! 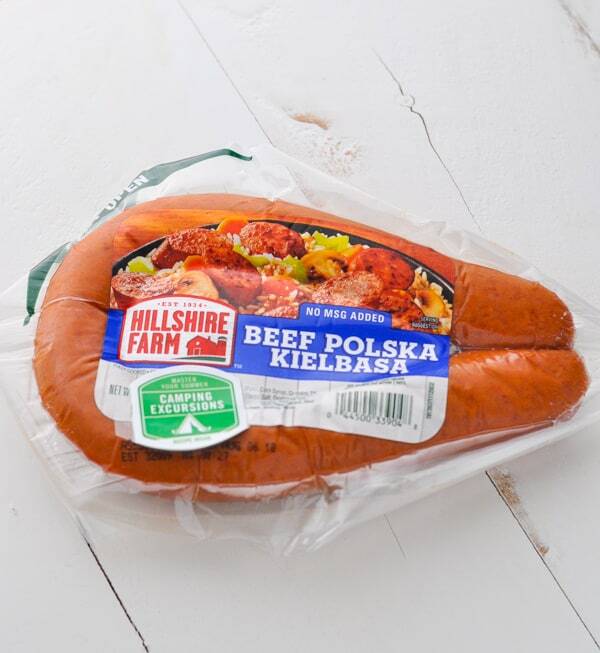 I purchased my kielbasa at Safeway, but you can find the Hillshire Farm smoked sausage products at your local Albertsons as well. As you’re shopping this season, you’ll notice that each package has an activity badge sticker attached with summer recipe inspiration! 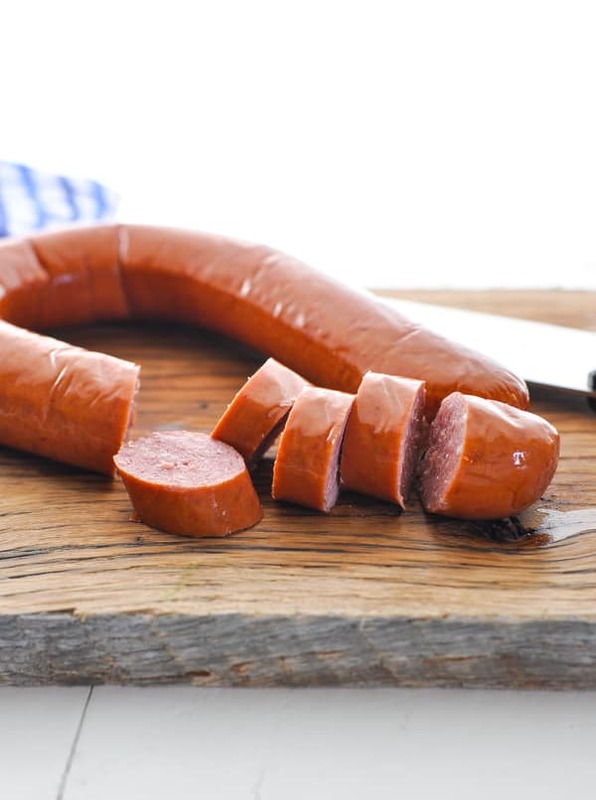 First, you’ll slice the kielbasa into bite-sized rounds. The peppers, onion, and pineapple will also get a quick chop. Once your ingredients are prepped, it’s time to assemble the kabob skewers. I like to thread the vegetables in rainbow order (giving them that extra Hawaiian touch), but it really doesn’t matter! Next up: the special sauce! This is just a quick combination of barbecue sauce and pineapple juice. Again, we’re keeping it simple and easy to transport — just in case you want to take these out into the woods! Use some of the sauce to baste the kabobs before they go on the grill, and reserve the rest of the sauce for basting as they cook. Ten minutes later you’ll be feasting on the most decadent combination of sweet and savory tropical ingredients! 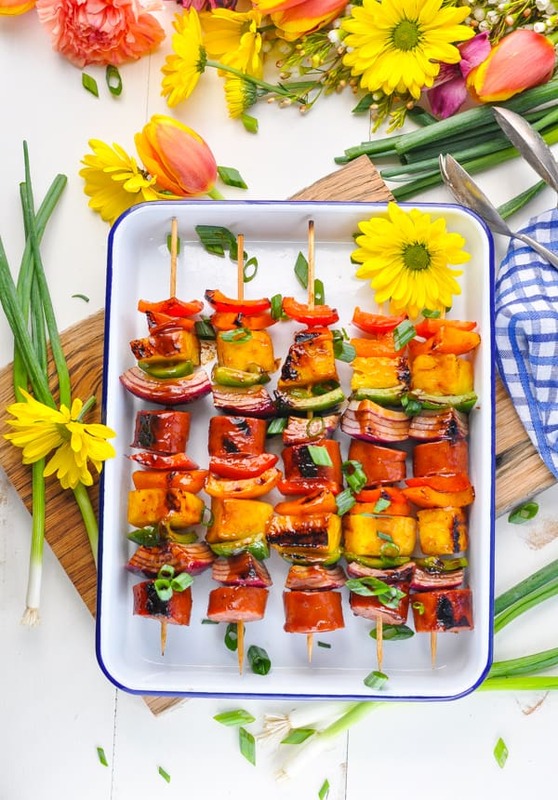 These kabobs are a great way to feed a crowd (just double or triple the recipe), adding a colorful and festive touch to any summer celebration. 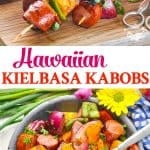 What should I serve with the Hawaiian Kielbasa Kabobs? The kabobs are a satisfying meal on their own, but they also pair nicely with rice (or cauliflower rice for a lighter option). 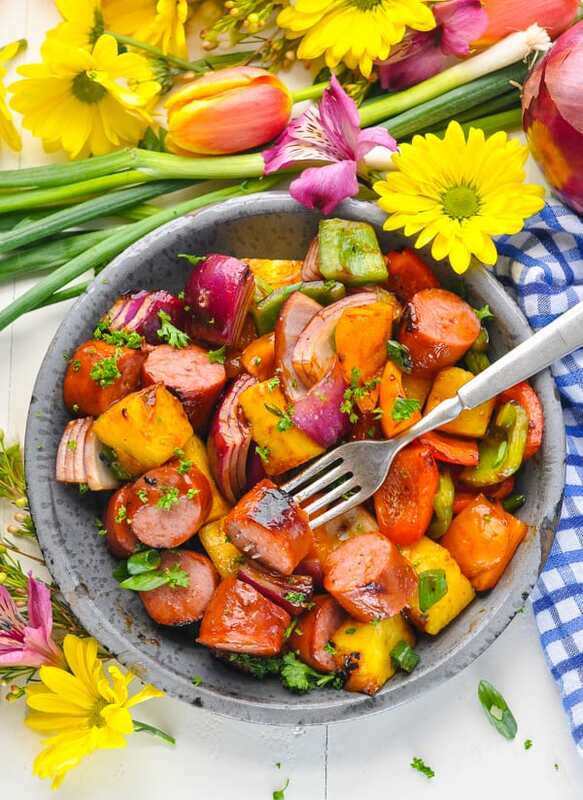 Don’t forget that you can pick up the Hillshire Farm smoked sausage, as well as the other ingredients that you see here, at your local Albertsons. Use the store finder to locate one near you! For even more recipe inspiration, click here! Thread kielbasa alternately with peppers, pineapple, and onions onto wooden skewers. 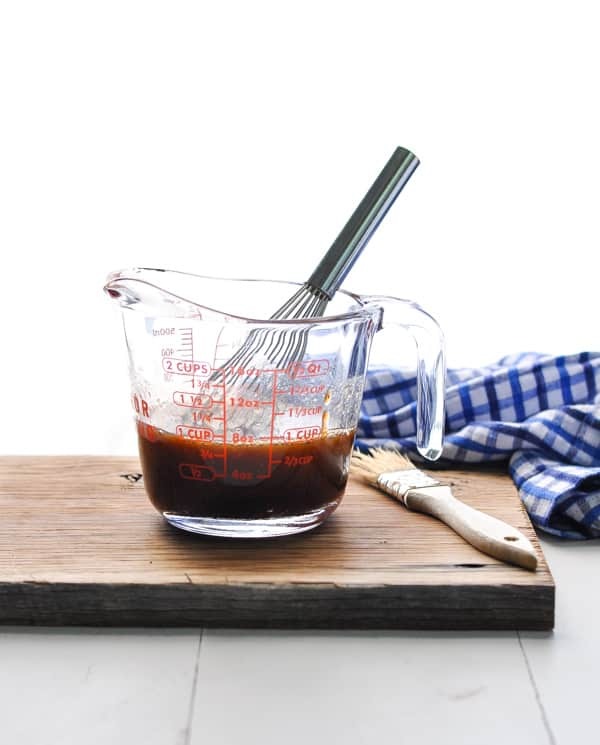 In a small bowl, whisk together barbecue sauce and pineapple juice. Brush sauce evenly onto the kabobs, reserving at least half of the sauce for basting later. 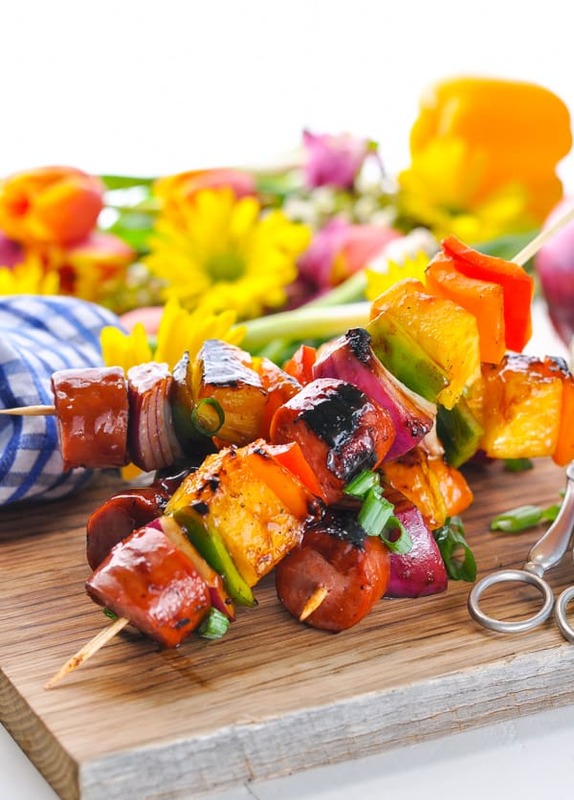 Grill kabobs for 8 to 10 min. (or until sausage is browned and vegetables are crisp-tender), turning and brushing occasionally with remaining sauce. If you don’t have a grill available, you can also sear the kabobs on a griddle or in a large skillet over medium-high heat. Perfect for grilling on Memorial Day! Thanks for sharing!